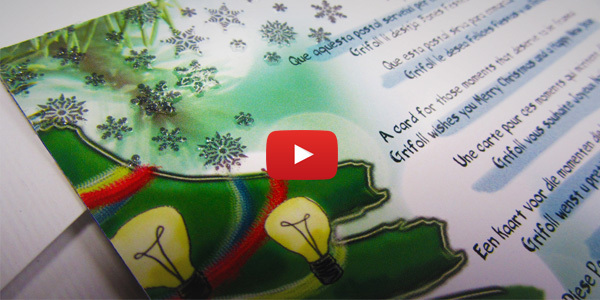 This year Grifoll wishes you a Happy Holidays with a card full of surprises. We have printed glitter in the snowflakes. The lightbulbs will glow in the dark thanks to a luminescent ink. The upper layer is a card, and the lower layer is a flexible magnet. You can separate the parts and get a beautiful magnetic frame for your refrigerator and a tic-tac-toe! You will be able to frame your greatest moments of 2016 with this amazind Christmas Card. We wish you a Merry Christmas and a Happy 2016!